One of the state’s two marijuana testing labs is under investigation this week after Framingham police accused the lab of improperly throwing hundreds of vials of cannabis products into an unlocked dumpster. 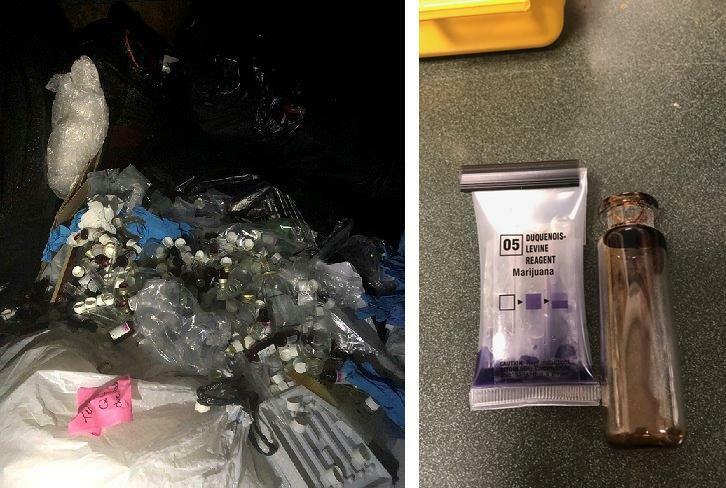 An officer investigating a suspicious car near the trash bins behind MCR Labs on Sunday peered inside the dumpsters and saw the glass vials. Some were filled with a green liquid, others a brown sticky substance believed to be marijuana extract, police said, adding they also found green cannabis buds and powdery residue. Police say state regulations require the substances, some of which tested positive for cannabis’s main psychoactive compound THC, to be rendered unusable before being thrown away. Police collected at least 10 bags of evidence including the vials and documents. The city reported its findings to the Massachusetts Cannabis Control Commission, which is investigating. The commission has not sanctioned the lab as it continues to look into whether it violated regulations, said Valerio Romano, an attorney for MCR. Romano said the lab typically follows the state rules and mixes all post-test marijuana materials with other substances to make them not usable for getting high, though they may still test positive for THC. Romano said the lab is reviewing what happened in this case and who was responsible. The lab will now stop disposing of items in dumpsters and instead compost or burn their waste in accordance with the regulations, Romano said. MCR Labs is one of two in the state that verify the potency and lack of contaminants or pesticides in all the legal pot for sale. If it were closed, even temporarily, that could cause a slowdown of marijuana supply being available for sale throughout the state, Romano said. MCR, which formerly tested just medical marijuana, was approved to test recreational cannabis in November. The Cannabis Control Commission had reviewed its procedures and verified it didn’t have any open investigations or unresolved issues, a spokeswoman said. But in 2017, an MCR employee was fired after she was accused of stealing thousands of dollars of medical marijuana testing samples from the lab. Police searched the Westwood home of the employee, Marta Moricz, after they suspected that her son had brought some of the product to Norfolk County Agricultural High School in Walpole, where a student ingested some and became sick, according to a report by WBZ-TV. The latest police investigation began around 9:30 p.m. Sunday, when a Framingham officer was patrolling near the lab at 85 Speen St. He noticed a suspicious car parked on the curb next to the dumpsters in the rear of the property, according to a police report. The car was empty and appeared to have been parked in that spot for “hours or days,” so the officer walked around it and looked inside the dumpsters, the report said. There, he saw hundreds of glass vials. He noted in the report that the dumpsters weren’t locked or in a gated area — in fact, anyone could have accessed them, “including children,” the report said. State regulations also call for at least two lab employees to witness and document waste disposal, with records kept for three years. Framingham Mayor Yvonne Spicer sent a letter to Cannabis Control Commission Chairman Steven Hoffman reporting the incident. On Tuesday, the commission’s investigators were at the lab all day, Romano said, adding that the lab will cooperate with the investigation. “I’m confident that MCR will address the violation swiftly with the commission,” Spicer said in a statement.